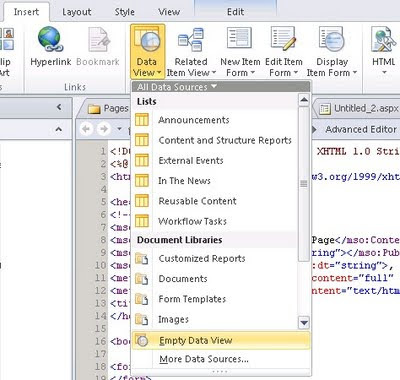 The Data View Web Part is all about aggregating and managing data from various data sources. They are able to retrieve data from various data sources and appearance of that data can be adjusted by applying Extensible Stylesheet Language Transformations (XSLT). Here are the steps to create a simple web part. 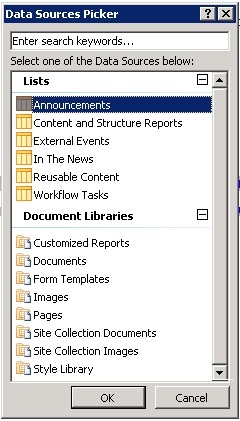 Open SharePoint site in SPD and create an .aspx page ("All Files"->"Pages"->”New”->“ASPX”). Right click new .aspx page and select "Edit File in Advanced Mode"
Before doing any changes, save the page. It will automatically add required references to the top of the page. Then add an Empty Data View to the page. Select "Click here to select a data source" option to select a data source. 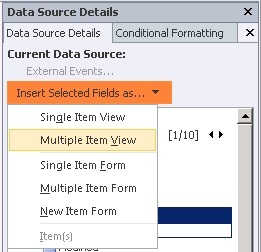 Selecting a data source will lists all the available fields in the right hand side, in the "Data Source Details" pane. Here we can select required fields to be displayed in the Web Part by holding Ctrl key. It should be noted that even though we didn’t select a field from data source details, we can use any available field for conditions checking, etc. Once required fields are selected, expand "Insert Selected Fields as..." dropdown from the same pane. In here to have multiple items in the WebPart, select "Multiple Item View"
Now we are in a state of we can preview the Web Part control. Save changes and press F12 to see the page in browser. In the above view we get all the records listed as a table. 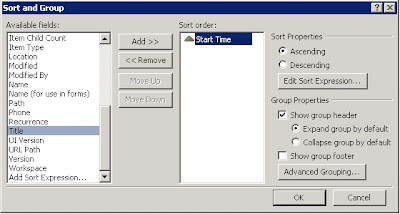 If required we can do the modifications like Grouping, Sorting, Paging, etc. For that select Web Part in the design view and go to "Options" tab. 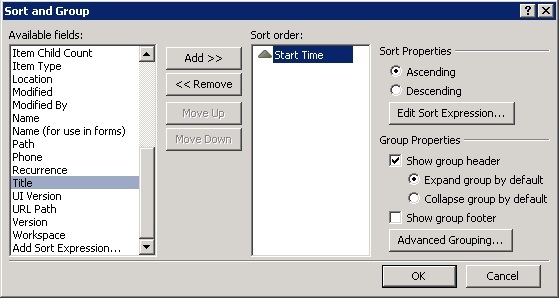 For grouping, select "Sort & Group" option. 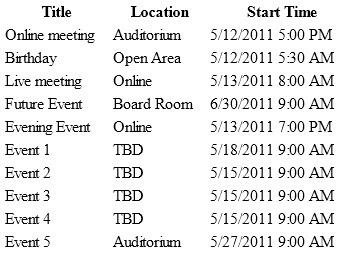 Here I have sorted recodes by Start Time and also grouped records by Start Time. If we check the “SelectParameters” section of the Web Part code, we can see Data Source is referred using ListID. Here we can change it t List Name or List URL to add more flexibility. First change "ListID" to "ListName" and give list name in the "DefaultValue" field in the SelectParameters section. <parameterbindings>" section and change "ListID" to "ListName"
and "DefaultValue" to name of the list. Find "" statement and add styles around "" part to apply styles to the whole control. It will work as a wrapper style for the Web Part surrounding all items. If need to add a wrapper styles around each list item separately add it around following section. Select Web Part in the designer and go to "Web Part" tab, select "To File" option. Go to SharePoint project in the Visual Studio and add a Web Part control (Ex: WebPart1). Delete “WebPart1.cs” file since we are not going to use it. Open “WebPart1.webpart” file and replace its content by the content in exported file. Remove "ListId", "ListName" properties in the “WebPart1.webpart”. This was an excellent post. Well-written, informative, and helped me out. Thank you!